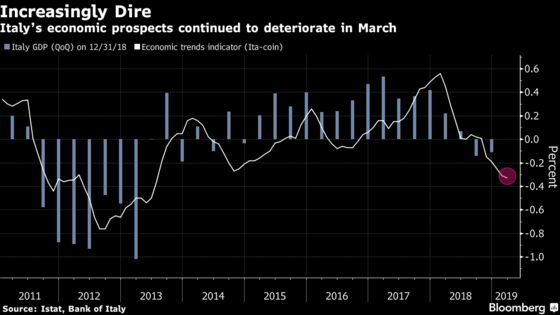 Italy’s recession probably extended into the first quarter of 2019 and there are fresh signs that the euro region’s third-biggest economy may struggle to emerge from its slump in coming months. A Bank of Italy indicator of economic activity fell in March to the weakest level since July 2013. The OECD predicted last month that the economy will shrink 0.2 percent this year, which would mark its first full-year contraction since 2013.